Almost twenty years ago, when I became a thief, I began by simply watching the patterns of the old man down the street. Every morning he rose early to tend his treasures. It was obvious he took great pride in this lifetime accumulation and he protected his wonders with everything he had. A year or two passed and I noticed he was failing. Early risings were rare and though he still cared for his beauties, it was clear that all was not well in his world. Another year and his lovelies rose up in spring without any care. They were strong and hearty from 50 years of his love and attention, but they missed his nurturing hand. The following spring the house went up for sale. It was empty. I know this because I skulked over there at 1:00 a.m. one Sunday and checked it out. My nighttime skulking began at the tender age of six, when my sister and I developed something we called the "cat prowl." To complete the prowl, which fast became a popular activity among our parochial school set, it was required that we sneak out the bedroom window late at night, scamper to the street then follow a route which took us past the back windows and through the gardens of a dozen of our neighbors. We were, essentially, school-age window peepers. We threw in a little moonlight dancing, a little fantasy among the hollyhocks and roses, but our greatest thrill was viewing our neighbors through their windows when they believed themselves unobserved. I have long known that a proper nighttime skulking outfit is entirely black, with black shoes, black hat, black black black. So I crept about my neighbor's home, attired in the proper garments, and I observed his cherished babies where they slept. A rescue was clearly in order. It was my first plant theft conducted at midnight with fast-beating heart and an utter terror of being caught. 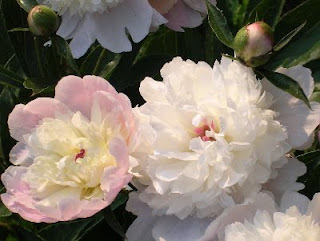 I liberated six huge clumps of those lush, 50-year-old peonies, each root bundle as large as a bushel basket, and I planted them in my very own back garden where they have bloomed ever since. How fortunate, because the entire 50 x 12 foot bed so lovingly tended by that sweet old man for his entire adult life was subsequently plowed up and planted with boxwood and (shudder) red-tipped photinia. How utterly mundane and how sad. The following spring, I noticed a number of the ruby-red slender arms of the ancient peonies breaking through the soil. I was heartbroken to see the new homeowner whacking at them with a weedeater. Another spring and they no longer even tried. I wonder whether they sleep still beneath the soil in that spot, so long a nourishing home for their immense and tangled roots. Are they waiting down there for someone to love them properly? to appreciate their rich beauty, their immensely heavy softly colored heads perfuming the air for half a block? It was the first theft, not the last. Subsequent thefts were more brazen: houses up for sale and empty. Once the sold sign went up, off I went at midnight (properly dressed, of course), spade in hand. I liberated ancient peonies, Madonna lilies, phlox, iris, roses. I eventually took to liberating ancient moss-encrusted birdbaths from houses near the airport slated for demolition. I found old troughs, bird feeders, great moss-covered stones. I was a full-fledged garden thief and unashamed. My favorite liberation was accomplished at sunrise just before a bulldozer cleared a path for a new driveway in a house just a mile from my little cottage. Milk and wine crinum lilies, those rare old southern heirlooms, were freed from the rock hard soil as the impatient driver raced his engine and bellowed at me to get out of his way. The result stands sentry at the start of my south garden path and the scent is intoxicating. 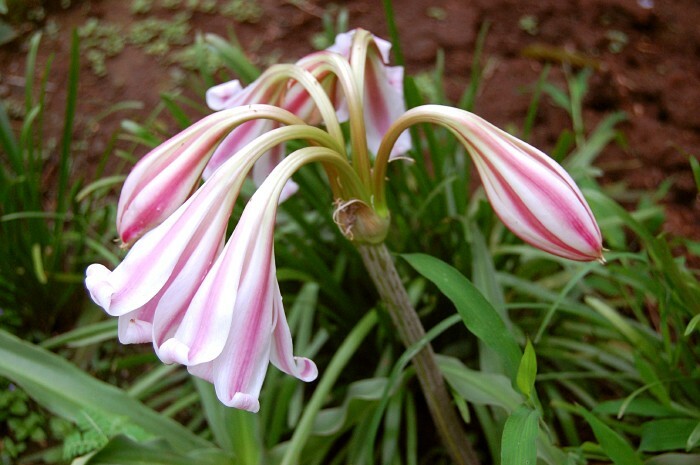 Their heads rise up at dusk to invite pollination (don't we all rise up at dusk to invite "pollination?") and they release the richest perfume. Magnificent. Addictive. Stolen. I've never even thought of liberating lilies and roses and peonies from soon-to-be plowed under landscapes. What a great idea! Of course, I'm always, ALWAYS asleep at midnight, so an idea (rather than a deed) it shall remain. Cara - what a wonderful story, written, as always, in that style which we have sorely missed in the past year or so. It has reminded me of a story about my own dear Laurent and a stand of hollyhocks that I must write about one day. Many thanks - as always. Peonies are my favorites. No signs of mine yet but they'll be up and blooming soon. OH Lynette....no one can tell a story like you, bringing emotion and memories and colors and smells and tears....how I miss reading your posts....thanks for this one, as you know I can relate to the garden theme!!! Just wanted to pop over and say hello and let you know you're on my mind. :) Wonderful to drop by and enjoy your stories again. God, what I would give to be your shadow, just listening, listening, listening. You are amazingly talented. My sister and I had a secret wall knock which signaled our version of your cat walk. We would walk a sliver of ledge from our windows to the roof of the lower section of our bi-level, bracing against the eaves with our free hands so as not to fall and break a leg. All for thirty minutes of racing the neighborhood at night, free of all constraint. I thought we were alone in that. How pleased I am to read otherwise. Hi sweetie pie ... I am delighted to know that you and your sister also experienced that midnight freedom. Wasn't it absolutely joyous? It is a memory I will treasure the rest of my life. I feel blessed that we grew up in that time, in that town, with that kind of freedom and safety. I am still enchanted by running around in the moonlight. Thanks for dropping by. Sue ... No, you, you are a magical writer. Your beautiful love story was the most delicious treat. I absolutely loved it and am recommending it to friends at every turn. Thank you for visiting. You have given me the freedom to come out of the closet as an abandoned garden thief.